Christians in the United States are increasingly alarmed at the rise of the martyrdom of fellow believers across the world. When dying for our faith comes to our own shores, it’s even more troubling. We often think of the tossing of Christians to the lions in ancient Rome when we think of being hated for the Faith. 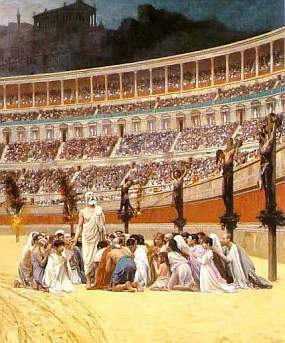 Only one of the above, though, convinced Roman leaders to send Christians to die a martyr’s death in the Colosseum. Can you spot the telling difference between the two lists? Today, fellow believers in other countries are martyred for the same reason as ancient Christians in Rome. Consider too the message of the apostles. It was their view of who God is, talking about Jesus, and putting Him above all else that enraged others enough to kill them. If you and I must die a martyr’s death, the only real martyrdom, the only genuine reason to die for the Christian faith, is the person of Jesus. Be hated because we believe Jesus Christ is Lord. Being hated for anything on that second list is not the point. Being hated for being opinionated about social issues, or voting for conservative politicians, or for homeschooling, or for anything else that is not Jesus is not martyrdom for the Faith. Meditate on that earlier Bible verse for a moment. I write this today because of my concern that we may be unclear on this. The way we talk about why people might hate Christians has little to do with the person of Jesus Christ and what we think about Him. Instead, it seems to be about our opinions on everything else. There’s enough scandal in the person of Jesus and what He said and did to rock anyone’s world. But, in the United States, is Jesus truly the primary reason people hate Christians? If not, then we need to change the focus of our rhetoric. One day, if they do come us, let’s ensure we die for the right reason. 1. Too many churches love past culture more than their current context. 2. Too many churches love their comfort more than their mission. 3. Too many churches love their traditions more than their children. Let me begin by laying some groundwork for my thoughts. For the past 35 years or so, the Church in America has been on a tear to reconstruct itself. In that time, we have seen major initiatives within most churches and denominations to adopt seeker-sensitive practices, to move toward church growth models, and to become more culturally relevant. Considering the state of the Church in America today, one must be forced to admit that almost all those initiatives have failed miserably to produce more or better disciples. I’m not sure we can find any Christian leader who thinks the Church, as a whole in America, is better off, by nearly any measure, than it was before this experimentation began. Biblical knowledge, conformity to Christian doctrine, evangelism, retaining our youth, community—those initiatives mentioned above failed to produce desired outcomes in any of those areas. I want to focus on one aspect of those initiatives especially, since it pertains to the core of Stetzer’s comments: the Church meeting as outreach tool. When you have dominant seeker-sensitive churches confessing that their model failed entirely to make disciples, have we put too much confidence in our switch from “church for believers” to “church for unbelievers”? I think that outcomes show us the answer is yes. Not only did turning our church meetings into a nursery for non-Christians NOT gain us the outcomes we desired for them, but we sacrificed our ability to make deeper, stronger disciples of the people we already have who already believe. “Church meeting as outreach tool” backfired. We moved away from sending Christians out of the church to make disciples out in the world before we bring them into the church, and it cost us dearly. What we do in our meetings must be for the edification of those who already believe. Changing that to cater to nonbelievers has been a stunningly bad decision that must be reversed if the Church is to start rebuilding itself. My concern with the Stetzer piece is that it’s trapped in the amber of the 1980s, promoting a ministry philosophy that over 35 years has proved largely incapable of creating disciples, which is the primary mission of the Church. Stetzer’s points #1 and #3 above are essentially the same, just tweaked for different age emphases. I’ll address them together. Again, what has this gotten us when it comes to making disciples? Nothing. Stetzer’s main beef is with tradition. I think that’s an old argument left over from 35 years ago. It’s not the point. Going back to that Luke passage, the Church is missing that point when it focuses on being counter-tradition. What it should be is counterculture. More than ever, I believe the fix for what ails the American Church is not culture but counterculture. I strongly believe that many people today are desperate to get away from contemporary culture and back to a slower, more personal, more meaningful place that does not shift daily at the whims of style leaders and their thought leader cohorts. That word authenticity keeps rearing its head. In fact, I have come to wonder if the solution for the Church is to instead examine culture and then head 180 degrees in the other direction. That mentality may also ask that we examine tradition and see if it is, in fact, already 180 degrees. If so, then rather than throwing it out because we are counter-tradition, we instead consider embracing it when it’s counterculture. Stetzer derides being stuck in the 1950s, but I think it’s not just the elderly who are nostalgic. Young people are growing sick of modern culture too. They’re looking for counterculture, but what they’re finding instead in our churches is cultural concession. The world piped, and the American Church danced. For the last 35 years or so, that has benefited no one. While I agree that the mission of the Church must, in many ways, conflict with comfort, cultural concession is tiring. I may be speaking solely for myself, but when I come to church on Sunday, the last thing I want is trendiness and the very cultural crap I’m forced to wade through daily. When the Church looks just like the world, no option for a “set-apart place” exists. Yet people are desperately searching for such a place. In a world governed by clocks, where are they to find the comfort of timelessness? In a world filled with 15-minutes of fame, where can they find the comfort of lasting meaning? They are NOT finding those essentials in a church that operates like a cultural haven, yet that kind of comfort is a necessary balm. We desperately need that kind of comfort if we’re to be refreshed to go out into the world and be countercultural. 1. Make the church for the Church. The seeker-sensitive model failed. Bring back the model that intends for Sundays to be the time when maturing believers are fed meat, not milk. Make it a safe place to practice spiritual gifts and to do the mature things a mature Church fellowship should do without fear that some unbelieving visitor will be weirded out or offended. 2. 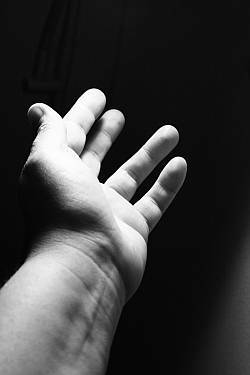 Remember that outreach means to reach out. The mission field exists beyond the four walls of the church building. 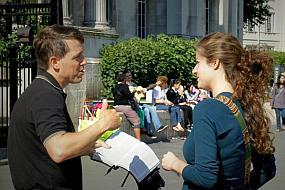 Equip people to evangelize out there. Lead the lost to Christ out there, then bring them into the church. 3. Be countercultural. Instead of doing whatever the world is doing, ask if the opposite is the better, more lasting way and closer to the heart of God. You may be surprised how many people are looking to escape culture rather than to embrace it. We’ve had 35 or more of failed outreach ideas. Time to stop doing what doesn’t work and get back to what people really need.